Fixed the issue with slowly applying the material or merging the model at first time after starting the utility. Fixed the issue with keeping the settings of the Target Lights after relinking the ies file. Fixed an issue with rendering thumbnails for Materials. 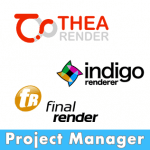 Fixed the minor specific issues when user renames or deletes the directory. Fixed the bug after using the “Reset Settings” option. Fixed a some minor issues with updating the plugin. Fixed a issue with using a custom menus. Fixed a issue with freezing the interface when searching files on Explorer tab. Fixed a some minor issues with setting the directory for searching for ‘Batch Render&Relink’ tool. Fixed a some minor issues with interface in the ‘Batch Render&Relink’ tool. The license keys generated in the 2.11.00 or earlier version is require updating. Please use the dashboard for sending a request for update. 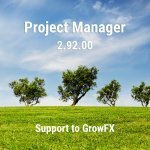 Related to "Project Manager v.2.16.30"